Part two in our three-part series “Oh crap, this voucher is expiring soon” takes us to SOHO, right across the street from Cleveland’s West Side Market. SOHO (or SOuthern HOspitality), as you can guess, specializes in slightly different interpretations of traditional Southern cuisine, meaning some good comfort food – fried chicken, shrimp ‘n grits, po’ boys… It’s a small, cozy space, complete with unique, appropriate decor, so reservations are probably recommended, particularly for weekends. Nothing fancy, just comfortable. 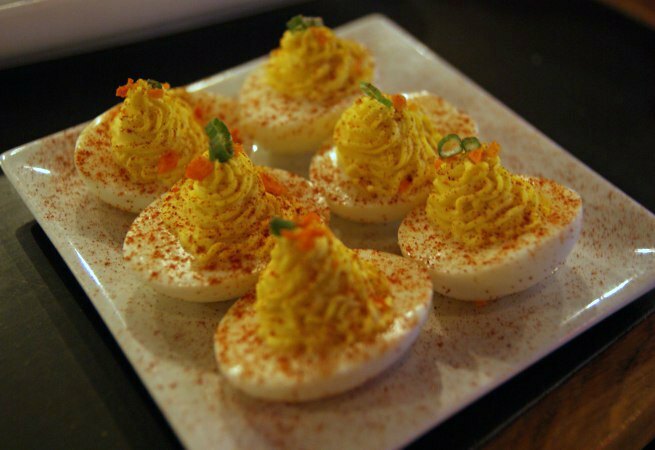 For starters, we split a couple sides, the deviled eggs and jalapeno hush puppies. The eggs were simply prepared (no bacon sprinkles or foie gras mix-ins), but good. 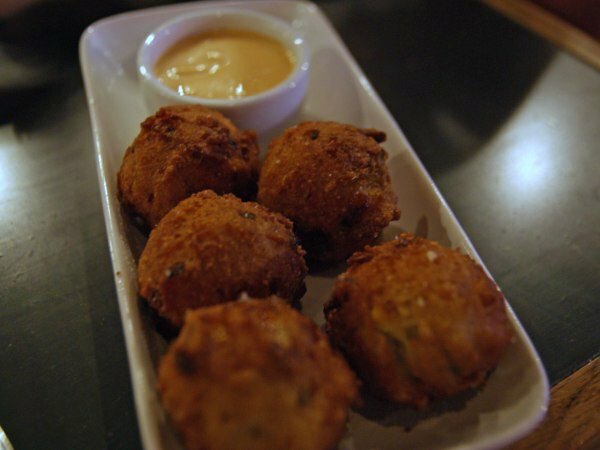 The hush puppies had enough heat to make you notice, and were pleasantly crunchy on the outside with a nice dipping sauce. 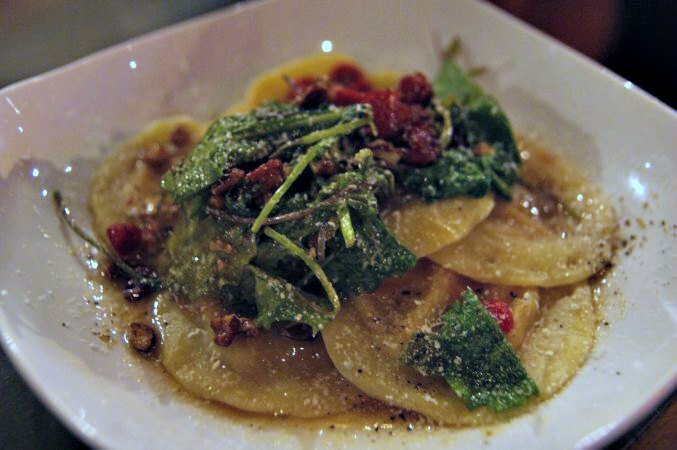 S tried the brown butter sweet potato raviolis, complete with spiced pecans, goat cheese, cranberries, and wilted greens. She’s not a real big goat cheese girl, but it was nicely muted – just enough of that tangy flavor to pair with the sweetness. The dish was not too heavy, as pasta can tend to be. I opted for the low country boil – a bowl packed with clams, mussels, shrimp, crab, rice, lobster butter, baby potatoes, corn, greens, and soppin’ toast. 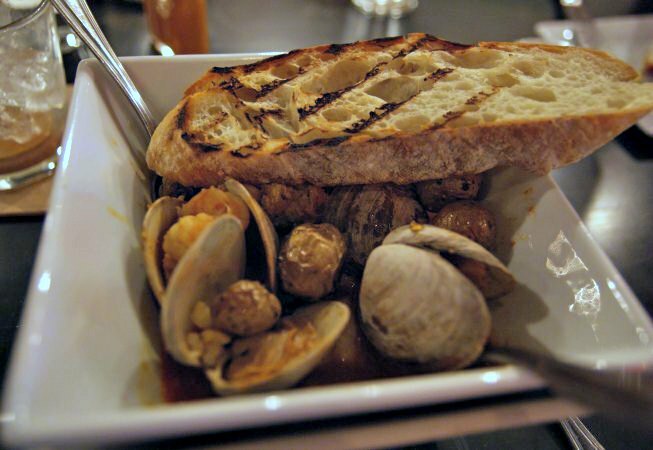 The seafood was all excellent, and the entire thing was very flavorful, and the thick grilled toast was indeed perfect for soppin’ up the leftovers. And for dessert, we tried the homemade banana puddin’, topped with whipped cream and chocolate dust. Rich, creamy, and no fresh-from-the-box taste! 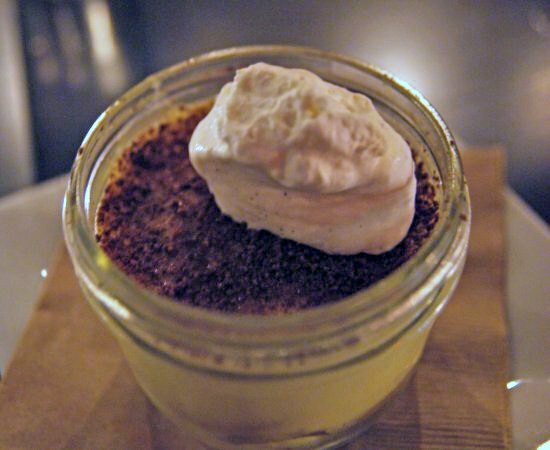 The verdict: SOHO gets almost six stars out of seven. The food was great (and portion sizes were not overbearing), prices are reasonable (all the fried chickens are $16, suppers are $18), and the only thing missing from great Southern service was the accent. Stop by for lunch after a morning at the market!